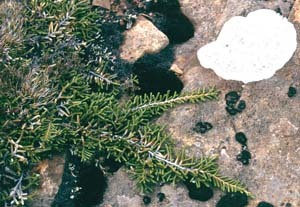 Microcachrys tetragona (Creeping Pine or Strawberry Pine) is a prostrate native shrub found in alpine and open subalpine areas of central, western and southern Tasmania. It is fire sensitive and only grows in fire-free areas, often in rocky areas. It is slow growing and may live for hundreds of years. Microcachrys tetragona is endemic to Tasmania and is the only species in this genus. The adult leaves are scale like, overlapping like tiles and are opposite and decussate so form four rows up the stem. These leafy stems are only about 1-1.5 mm across and square in cross section. Seedlings have never been recorded (sometimes resprouts from trunks buried in the peat are mistaken for seedlings). 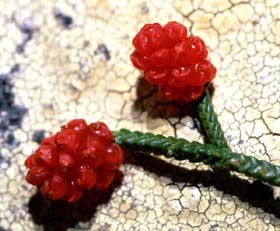 The female cones are small (6-8mm long and 3-4mm across) and when ripe are bright red and fleshy with 20-30 seeds. This species is often confused with Diselma archeri, which lives in similar areas. Diselma archeri has similar leaf size and arrangement to Microcachrys, but is generally erect, and has stomata at the base of the outer surface of the leaf.